It's comforting to know that when your beloved pet becomes ill, he can receive expert treatment right here at Cats and Dogs Animal Hospital -- but wouldn't it be even better to keep your pet as well as possible all year round, year after round? Preventative medicine is the key to assuring a happy, healthy, comfortable life for your favorite animal. 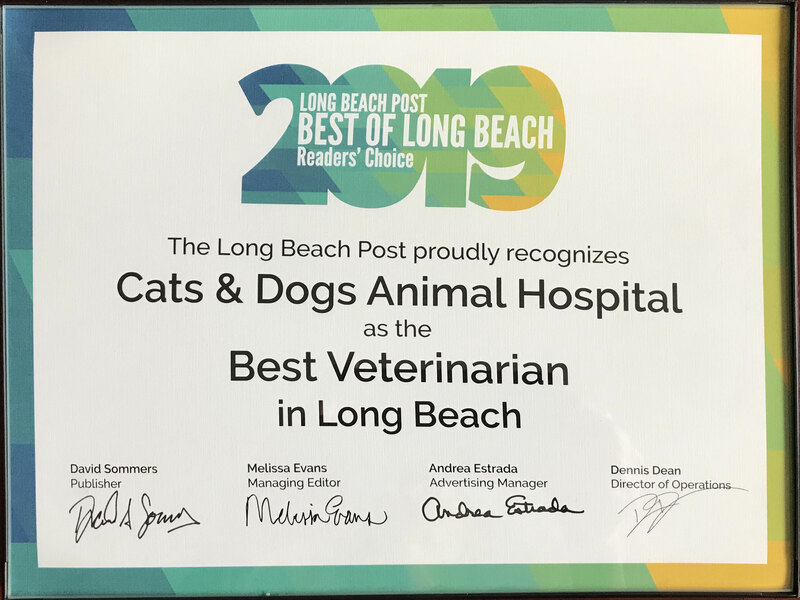 That's why our Long Beach veterinary clinic makes a point of providing (and recommending) many kinds of pet wellness care. Pet exam - An annual exam enables us to check your pet carefully from nose to tail, inside and out, for even subtle signs of trouble. A typical exam includes evaluation of the eyes, ears, skin, mouth, coat, stance, gait, behavior, and weight. We also run laboratory tests to check for parasites, diseases, and organ dysfunction. Pet dental care - We can perform a dental checkup as part of the exam. We can check for cavities, abscesses, infections, gum diseases, oral cancer, broken teeth and other issues. We also deep-clean the teeth to remove the tartar that promotes gum disease. Vaccinations and other preventatives - Vaccinations are critical for making sure your pet's immune system is armed and ready for certain deadly diseases. We also place pets on ongoing medications to prevent pests (such as fleas and ticks) and parasites (such as worms) from causing skin problems and other diseases. Spay/neuter surgery - Spay/neuter surgery is yet another important form of pet wellness. These surgeries actually remove or greatly minimize your pet's risk for diseases such as cancer; they also help your pet stay out of trouble by eliminating the mating urge. Our Long Beach veterinary team prioritizes different forms of wellness care at different stages of your pet's life. In puppies and kittens, vaccinations and spay/neuter surgery are especially critical. Adult pets may need close monitoring of their vital signs and weight, along with vaccination booster shots. Senior pets require twice-yearly exams with a focus on detecting age-related diseases and ailments, from cancer to joint pain. From the first weeks of life to the senior years, we can help your pet enjoy a healthier life. Call our clinic at 562-439-4228 to schedule a preventative pet exam today!